Does ROBERT WYATT have the sweetest voice and sharpest brain in English pop ? Is the English language a tool of cultural narcissism? Which Fleet Street daily has the best tipster? Twickenham's Mr Rottenhat tells SEAN O'HAGAN about the problems of being a Red in the stale bed of Western imperialist pop. Smoothed sheets by ANTON CORBIJN. It seems like that voice has always been there. Raising our eyebrows, bending our lips into smiles and, occasionally , knitting our brows in bemused wonderment. A reassuring presence, this voice, but also, paradoxically, a strange one. And, the ample evidence suggests, a strangely affecting one. For such an emphatically English voice to spread out and embrace such an eclectic international spectrum is further proof of an imagination that recognises no borders. Songs as diverse as Chilean poet Victor Jara's 'Te Recuerdo Amanda' and Elvis Costello's 'Shipbuilding', as Ivor Cutler's 'Grass' and Chic's 'At last I Am Free'. 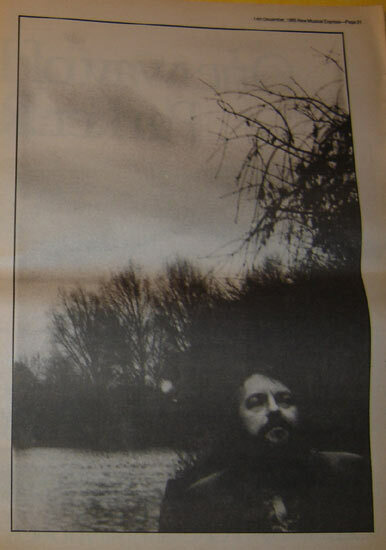 Yet Robert Wyatt's voice, its stately melancholy timbre, unites them all. WAY BACK then there was Soft Machine, then an experiment with Matching Mole. Then there was that accident. Silence. Then the former jazz drummer underwent a startling and painfully introspective sea-change - chronicled on'74's 'Rock Bottom' LP - to emerge from the depths, shaken but stronger in resolve. Both 'Rock Bottom' and its offspring, '75's 'Ruth Is Stranger Than Richard', still stand as resonant, multi-layered, richly-hued landscapes but, for a while, it seemed their maker. Another silence ensued, broken, by of all things, a hit single. Robert Wyatt even made Top Of The pops, singing 'I'm A Believer' and, in the process, exorcised the ghost of The Monkees as well. Then another cover : Chris Andrews' 60s opus 'Yesterday Man' underwent the Wyatt treatment. After that, another silence. ENCOURAGED by his wife Alfie and Rough Trade's Geoff Travis, Robert Wyatt returned in the late '70s with a series of very different singles. Again cover versions were the order of the day, again Wyatt imbued each song with his distinctive breath. These singles - now collectively known as the 'Nothing Can Stop Us' LP - contained only one Wyatt original, the scathing 'Born Again Cretin', but, more importantly, they announced a new intent, a declaration of independence. "Each song was chosen on quite a consistent basis, all part of a conscious attempt to make un-misuable music: music that couldn't be appropriated by the Right. This is also why the new stuff is much more straightforward. I was pushed into this by an alarming occurence: I was fiddling around on the short wave radio when I heard one of my old songs being played on one of those Western propaganda programmes - The Voice Of America or Radio Free Europe. Blow me, I thought, I don't want my music used in this way. So, I consciously set out to make records where the ambiguity was removed, records that would have to be rejected by anyone promoting Western culture. Now I make sure I always put a spanner in the works. A desperate move, but ..."
These spanners included heart-wrenching 'Strange Fruit', a bizarre 'Stalin Wasn't Stalling' (originally a patriotic American ditty), a Cuban folk anthem ('Caimanera') and, just so no one could possibly mistake his sympathies, a reading of 'Red Flag'. A VOICE FOR ALL REASONS? "REALLY, I'D say Costello and Langer were the ones who helped get my name known to the biggest audience. 'Shipbuilding' - that was the one that did it." 'Shipbuilding' is craftsmanship par excellence, the perfect, seamless grafting of political content and songwriting style. The song's deftly executed overview including the irony of working class labour caught up in the imperialist wheels of industry, is embued with a sad, knowing stoicism and the tenor of Costello's finestlyric fits Wyatt like a glove. 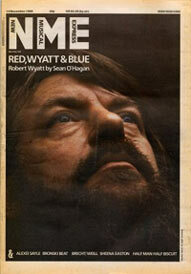 Like 'At Last I Am Free' before it, the song became Robert Wyatt's. Over the past few years, Wyatt's musical involvements have ensureda high profile: one third of the vocal frontline of Working Week's inspired 'Venceremos' debut; a meeting with Ben Watt on the latter's 'Summer Into Winter' EP; the 'Trade Union' outing featuring Bengali musicians Dishari; 'The Age Of Self' miners single, also featuring The Grimthorpe Colliery Brass band; and, finally, the celebrated jerry Drammers-produced SWAPO song, 'The Wind Of Change'. Last year Wyatt issued his own 'Work In Progress' EP wich, alongside three more excellent cover versions, included 'Amber And The Amberines', only his second self-penned song in ten years. "It's so bloody difficult to do my own stuff: that's why I'd much rather do covers or quite happily get roped into other people's projects. I go into this state of trance when I'm working on my own and really I have very little control of what I'm going to come up with. The songs tend to suggest themselves so the word 'creative' is a misleading one. For me it's more like fishing, dangling a line over the keyboards and hoping something will jump out at you". WHAT HAS "jumped out" is 'Old Rottenhat', an LP of ten new, original compositions. Continuing his catalogue of "un-misuable songs", 'Old Rottenhat' is, on one level at least, Robert Wyatt's most straightforward recording. Yet the targets he has chosen are slippery, ambiguous ones; the treacherous duplicity of political language, the lies that democracy depends on, the so-called plurality of thought that Western culture contains and the infectious spread of cultural amnesia. Behind this array of inter-related topics lurks the spirit of Marxist writer Noam Chomsky, that most mischievous disseminator of Western capitalist mores and guiding light in Wyatt's current way of seeing. The music remains as haunting and dreamlike as ever, yet here and there an accusatory tone or caustic insight defines a certain shift of emphasis and suggests an angry, spirited individual hides 'neath this most gentle of men'. 'Alliance', the record's opening statement, is a case in point - a song possessed of a political critique and a personal sting: "You're proud of being middle class (meaning upper class)/You say you're self sufficient (but you don't dig your own coal)." "It's a reactionary song. What I'm reacting against is being told that anyone who supported the NUM during the miners' strike was a mindless thug. I've got a couple of friends who, over the years, drifted towards the Alliance and what was nightmarish for me during 1984 was that the official opposition - as well as the usual right-wingers who want to smash the unions good and proper - wera all so busy evading the issues. They all put pressure on the miners to accommodate the state instead of vice versa and really the reason the state have such an easy time is 'cause the opposition is so namby pamby. That song is about being painted into a corner called extremism; you're pushed into a position because of the sheer unreasonableness of mainstream alternatives." "There are degrees of amnesia, ways to forget"
"The liberal and right-wing tradition here, and in the US, the big We, they have a kind of smug consensus which you can see in their self-image in the history books. This consensus gets its moral strenght, as far as I can see, from the fact that everyone else who tries an alternative seems to mess it up. Yet the argument for Western democracy seems to rest on expedience. I'm looking at what it means to be expedient all the time: it's expedient to boast about one thing and forget about something else. "It still happens all the time: take Western governments' involvement in the Pacific, which never gets publicised. That's why I wrote 'East Timor'. Indonesia, with the West's backing, decided to take East Timor and when the people reisted there was genocide on a massive scale. We need the Pacific for a source of constant cheap labour but we don't hear about the people who are still fighting out there. Now people say they are not interested in all these foreign problems, but our taxes are financing this sort of thing - you can't have it both ways. The song also concerns the very fact that nobody has heard about East Timor. Subtle stuff." 'The Age Of Self' confronts a different, no less pervasive form of amnesia: the constant accusation that the Left is too tied to the past, too fond of its heritage to be a relevant force todat: "they say the working class is dead, we're all consumers now". "Yeah, well, I'm all for progress on the Left but you don't do it by disowning your past, by saying you're ashamed of the unions and that. Telling the press we're really with-it now, we're not boring old Lefties - always eager to accommodate them. See, one of the things the Right have going is the continuation of their own romantic myth. It's quite a legitimate stance, actually. I think the Left should be like a family where the feeling you have for each other transcends all the pretty differences, and that strenghtens all of you. It shouldn't be: let's move forward and discard the industrial workers. I think mutual affection is more in order..."
Is that why you turned out to the Red Wedge launch ? "Yeah. People seemed surprised, but the musicians asked for a bit of moral support and I came along. It's good for the Labour front benchers to meet people like that, though I didn't really qualify: I'm not a Labour Party supporter and I'm definitely not a youth!" "WORDS TAKE THE PLACE OF MEANING"
LANGUAGE, ITS open-endedness and malleability, is something that has always tickled Robert's fancy but, where he once used to play on words, he now draws attention to more sinister types of word-play. 'Vandalusia' simply recites a few well-worn phrases; terms that have slipped into the English language as colonial archetypes and, through constant mindless usage, have become separated from their original, usually quite illuminating, meaning. One of Robert's choices, "beyond the pale", stems from Norman times when the English "owned" one part of Ireland around Dublin which they christened The Pale, originally meaning 'Boundary'. Now "beyond the pale" has established itself as a phrase meaning "uncivilised" and "outside the limits of decency". Interesting? "My preoccupation is to try and reclaim meanings from used words ans see how they function and it's very interesting indeed. Words resonate and grow and get hi-jacked by one side or the other, but now there's a distinctly unbalanced analysis of language. Everyone is so careful not to use left-wing swear words like 'fascist' carelessly, but the establishment use all kinds of words so carelessly. 'Extremist' and 'terrorist' are two that spring to mind. In the White House or the State Department a terrorist is anyone who believes in having good schools and hospitals and decides to do something about it. The media have to deneutralise words, steal their meaning as part of a process of self-justification for our method of democracy." The inter-dependent relationship between the right-wing government and their press, in this country, has now reached ridiculous, yet nonetheless exceedingly powerful realms. The press baron has an unassailable powerbase that, unlike the politician, isn't threatened every five years. The media can have power without responsability simply because the state is dependent on them to such a degree: hardly the ideal situation for democratic free speech to thrive. "Well, if you consider the idea of a 'terrorist', they never get a fair hearing which is part of the reason they resort to such extreme tactics. You ignore someone with a legitimate cause until they take up a gun in order to be heard. Then you say that you don't talk to gunmen. All the way along the line, the establishment finds a reason for ignoring them: first they're not powerful enough, then they get power and are ostracised. Either way it's avoided. The media operate on a rough consensus of who the goodies and baddies are and that, of course, works very well for the people who run the set-up." 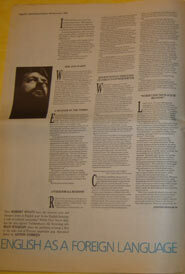 ROBERT WYATT is a soul caught in a bind: an unfortunate accident of birth has made him (poor chap) indisputedly English. He worries about this, as well he might, and has my utmost sympathy. Try as he may he can't totally escape the chains that bind him to Albion, althought his Communist Party membership will be enough to get him disowned in most quarters of this "liberal" land. Even the CP, for all its internationalism, calls itself the Communist Party of Great Britain: anunfortunate case of colonialist infection. "I feel like I could be an internationalist but the paradox is my extreme Englishness - I've desperately traced my family tree for some clues but the fartherest we come frim is Bolton! But I find Englishness, the English language, forms an amazing power group and for all its apparent broadmindedness, there is a totally suffocating cultural narcissism which is a real problem, not only for the rest of the world, but also for our future. It is, quite simply, an inability to allow other people, who aren't like us, the right to live how they please. That's a problem I address right from the first song. "It's not just a right-wing thing either but the unconscious racialism of the established Left which also takes this maternal view of movements around the world: telling other groups, in long essays, how to run their revolutions. We should have respect for people even though they makes mistakes." 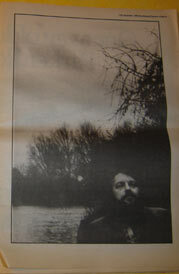 Coming from a middle-class background, Robert Wyatt is also familiar with the "cunningness" of liberal ideology: the lack of direction disguised as broadmindedness, the inability to make a stand and say what you feel.This all adds up to a kind of political paralysis, a "suffocation" as Robert would have it, which means an "opposition based on consensus rather than challenge, scared of even challenging the fundamental, psychological notions that justify imperialism". The song 'Gharbzadegi' is interesting in this context: being both a critique of 'Englishness' and a classic example of language becoming so analysed that it slips back into abstractness. "First up, the very existence of the word makes me laugh - I think it's an Iranian word meaning 'westernitis'. I'd like to take this opportunity to say that the record might have been called 'English As A Foreign Language', because I'm, at once, incredibly English and also very uncomfortable with it. So I keep trying to see Englishness from an outsider's point of view. When I come across an Iranian word that means 'westernitis' and soundslike some weird disease, describing how people from other cultures try and become like us... well, what a wonderful word! The song itself is a tricky one, it's not a literal song. It's near the end of the record because I'm on the verge of giving up struggling with words by then." "EVERY NIGHT I GO TO SLEEP, I ALWAYS DREAM IN RED"
WITHIN THE graduations that constitute the Communist Party, Robert Wyatt describes himself as "a Morning Star reader" and humbly suggests that if anyone wants to define that description their best bet would be to place an order for that august daily paper. It has, says Robert, by way of further enticement, "the makings of a good, all-round family newspaper: sympathetic to the international labour movement with a pop column, a gardening correspondent and the best tipster in Fleet Street" (he is reliably informed). On an artistic level, his politics and his music are inseparable although he eschews the role of demagogic educator so beloved of many agit-pop stars. "I don't bang my head against the wall trying to make people see my way as the only way. I'm more interested in trying to highlight certain issues, identify groups who need help to be heard. I work out where I stand on something and give my support accordingly, but it's not my place to choose issues and thrust them on people. Similarly I don't think we can tell South Africans how to get rid of apartheid; they ask for your help and support and you do what you can, but they are there." "I've got an 'at but it ain't like that - ooooold Rotten'at". ALFIE - OR Alfreda Benge - has been the single most significant force in Robert Wyatt's life: his wife, his inspiration, his record-cover illustrator and the main catalyst for his politicisation. In many ways, the album's semantic preoccupations concern her also. "The phrase 'old rottenhat' is a West London one which she picked up in her childhood. Now, she spoke German up until she was seven, so she actually remembers hearing English as a foreign language and German wasn't a very fashionable language round here in the late '40s (laughs). "Alfie really made me look at the borders and dotted lines with which we surround ourselves and which take on some great spiritual meaning. I learnt a lot from her and her family about politics and music." The name Michael Bettany is one now synonomous with betrayal but, amidst the stoked-up outrage that the media contrived, the individual's true plight, as ever, became buried: a self-made civil servant who worked his way up through the corridors of power only to reach the rarified suffocation of Whitehall. "I think his real crime wasn't trying to give secrets to the enemy but the fact that he challenged the official ideology of Englishness and realigned his loyalties. Now he's classed as a traitor: this vague notion of Englishness suddenly becomes very specific when it comes to crossing the line. But the actual pathos of his situation... he was looking for a way of breaking this dead end - having worked his way up to the top - and when he went to the enemy, they were actually double agents. "He'd gone as far as he could go to reach a world outside his own and all he reached was another layer of suffocation, a more sophisticated structure of confinement. A perfect subject for a short story. OLD ROTTENHAT gathers all the strands of throught that Robert Wyatt tries to make sense of and, amidst all the theory and analysis, a music emerges that is the very antithesis of constrictive formalism. A loose, bendy, floating music that playfully raises all the right questions and asks you to look beyond the boundaries. He seems to have absorbed so much music of the early 20th century, taking in the European avant-garde jazz movement along the way, slipping on his international hat and finally allowing whatever takes his fancy to enter his consciousness. We talk about English lovers-rock reggae, soul, Soviet Jazz and the "the sheer courage of Ornette Coleman", who "fought against everything including the place that other musicians had set aside for what they understood as avant-garde. Ornette broke all the rules good and proper and he came back to a good danceable beat!" When asked for current preferences, Wyatt talks enthusaistically about Artery, a group attached to The Morning Star, about Harry Gold And His Pieces Of Eight - a veteran of the "pre-war trad-swing style" - about Coleridge Good, one of the last of the "Jamaican Jazz musicians who came over here just before all the dance music arrived". His current favourite tune is Canadian folk singer Bruce Cockburn's excellent 'If I Had A Rocket Launcher', which Wyatt played, much to the consternation of the producer ("a little politics goes a long way, don't you think? ), on Gary Crowley's Capital radio spot. Yes, he's heard about Tears For Fears being big fans and rushed out and bought a copy of the single which included a cover of 'Sea Song' from 'Rock Bottom' on the B-side. "Oh, I was so impressed, it's a great feeling hearing one of your songs done well." The mind cannot help but boggle. And this music of yours, Mr. Wyatt, how would you describe it? I've heard it called folk? "Oh, I think that would be claiming too much for it. I honestly don't know what you'd call it, but it sure ain't rock'n'roll. I try to make completely normal records but they must come out funny... I haven't got that much control especially over this voice but, let's see... I actually do get very sad about the political climate - not in an abstract way but how it affects people... I am capable of much more energetic music, but I do tend to get brought down and it gets turned into a kind of English blues. Yeah! That's what I'd call it - English blues.